i often tease Abigail when she is upset about her work that she has the best job in the world. Certainly, if i were working for a paycheck, i would want to be doing what she does. She is the Director of Experiential Education and Prevention Initiatives at University of Oregon. I have written about the incredible work she does with peer education and interactive theatre working on sexual assault. What i have not bragged about recently is the work she is doing on other issues of oppression with the Rehearsals for Life Project at U of O, which she founded and directs. 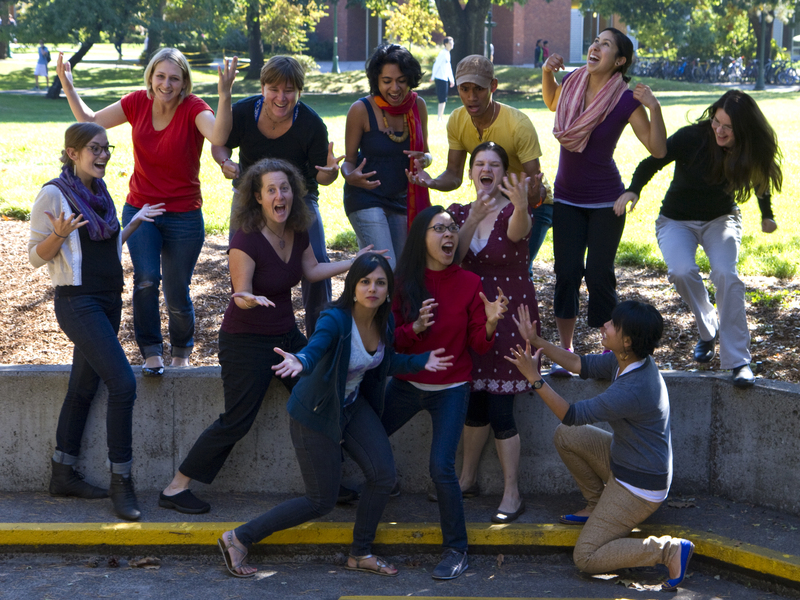 Using a combination of Theatre of the Oppressed, Playback Theatre and other forms of applied and interactive theatre, the troupe engages with audiences across campus about the subtle and less subtle nature of oppression in academia. They create scenarios and give people opportunities to intervene to change the outcome. The role play in the above video about the teaching assistant’s frustration with the student with a stutter is a perfect example of how conversations need to change to respect people and have a more fair world. In addition to workshops, Rehearsals for Life addresses the dynamics of inequity and complexities of social justice through personal storytelling. In this video they partenred with NPR’s Michele Norris and her “Race Card Project“. The project, invites anyone to comment in six words about the state of race in America today. In this performance RfL performs from Norris’ collection of six word stories and includes longer pieces of the actors true personal stories. Abigail’s work with Rehearsals for Life and Sexual Wellness Advocacy Team (SWAT) is engaging and pulls the often dry and pedantic world of academia into the vibrant and memorable world of theatre. Not the stuffy theater of rehearsed lines, but the more immediate, reality based theatre of improvisation & personal narratives backed by a moral directive to make things better. And this is fully 17% of why i love her.